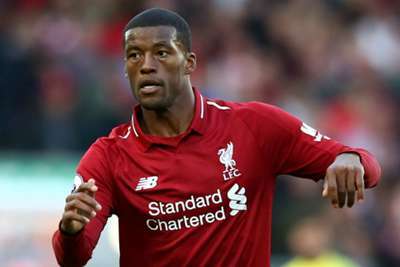 Netherlands coach Ronald Koeman joked that he hoped he would be back in Jurgen Klopp's "good books" after resting Liverpool midfielder Georginio Wijnaldum. Klopp has been a critic of the current international schedule, offering a particularly scathing assessment of the Nations League, as he wants his players to enjoy some rest as the Reds look to challenge in the Premier League and Champions League. And the Liverpool boss could only be concerned as star defender Virgil van Dijk pulled out of action with the Netherlands due to injury. However, Koeman has assured that Van Dijk should be available for Liverpool's trip to Huddersfield Town on Saturday, while he then left Wijnaldum out of a friendly against Belgium, teasing that he might have pleased Klopp. "Maybe Mr Klopp is now very happy and that's OK," Koeman said. "I hope I am back in the good books." A draw at Belgium followed a big 3-0 Nations League win over Germany, with Koeman hopeful this is just the start for the Netherlands, who have failed to qualify for the last two major international tournaments. "We know it is long way back, but we have seen a real improvement in the team," he said. "We started against Germany and got a really good win against a big opponent. "It is all about the final result. If you play France away [a 2-1 defeat] and don't have that final result then it is always difficult. One way [to improve] is to show what we can do and play good football, but the most important is to have a good result. "We beat Portugal, we lost 2-1 to France, we played Belgium 1-1, we won against Germany and we got a draw away against Italy - these are not the easiest of matches. "We are in a good way and I am really proud of the team."